The webbing belt with brass buckles is wrapped around the waist of Ursula Andress as part of her swim suit that she wore in the first James Bond film Dr. No (1962), in the famous scene where she, as Honey Ryder in Jamaica, walks out of the sea onto the beach. According to Gordon Joslin, 83, he came to Ms Andress’s rescue when she was filming the scene. The Swiss-born actress thought her costume ‘was missing something’, so a member of the film crew was despatched to ask sailors from the frigate HMS Troubridge who were on the beach to help out. 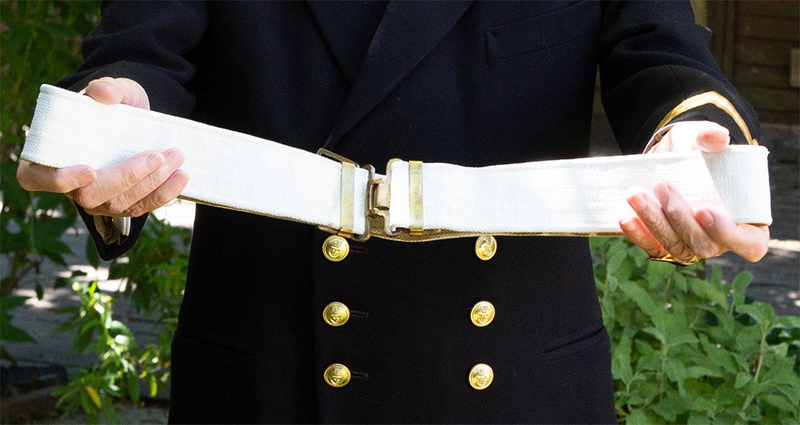 Mr Joslin - then a 28-year-old acting sick-berth petty officer - recalled: ‘The petty officer looked at me and said, ‘Let’s have your webbing belt.’ He grabbed it off me and it was wrapped around Ursula Andress’s hips. I didn’t get it back." Ursula Andress then filmed the scene again, rising from the sea, shells in hand, discarding her facemask, singing Under The Mango Tree, walking up the sugar-white beach. Joslin was prompted to reveal his secret after spotting a picture of Ms Andress in the bikini in The Mail on Sunday’s You magazine last month. He said he saw Dr. No soon after its release. "I went to see the film at the cinema in Portsmouth. I watched it and said, ‘Here is my belt, here it comes’, but nobody really believed me." Another member of HMS Troubridge’s crew recalled in 2001: "Our recompense was to have lunch with the delectable Ms Andress, who sadly covered herself up with a negligee. We also took back a cheque for the ship’s welfare fund. 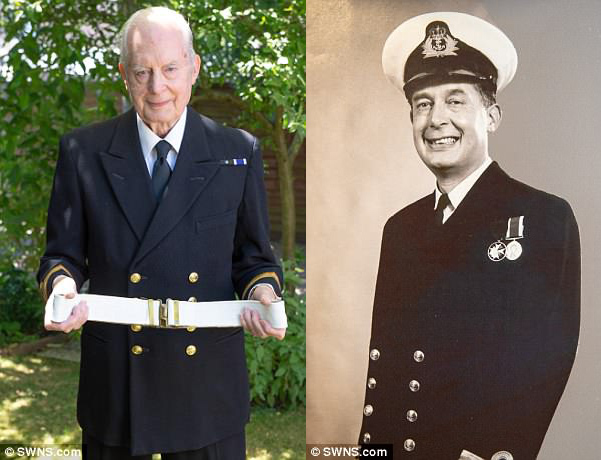 The ammunition belt… was written off as lost overboard." 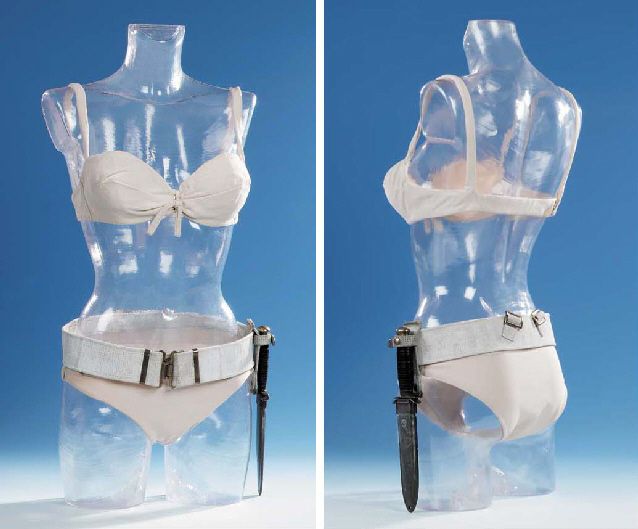 The belt and the bikini set worn by Ursula Andress as Honey Ryder in Dr. No were auctioned in the Christie's James Bond auction on 14 February 2001 (coincidentally Bond Lifestyle has been reporting about other items from that same auction recently, including the GoldenEye Aston Martin DB5 and Moneypenny's brooch). The bikini outfit was sold by Andress hereself, who said she found the outfit in her attic. It was purchased for £41,125 (including tax and commission) by Robert Earl, owner of the Planet Hollywood restaurant chain, to display at his outlet in Times Square, New York and later in London. The set has also been displayed at the Designing 007 Fifty Years Of Bond exhibition. The Christie's lot description gives more detailed information on the bikini, but doesn't mention the origin of the belt: "A bikini of ivory 'cotton' worn by Ursula Andress as Honey Ryder in the 1962 United Artists/Eon film Dr. No, the two-piece costume comprising a top, constructed from Andress' own under-wired brassière, covered in ivory cotton, the cups decorated with a dart detail, gathered at the centre and decorated with a bow detail, the bikini briefs, cut across the grain, gathered at the hips and embellished with decorative straps, fastening at the left-hand side and lined in cotton -- the bikini designed by Andress in conjunction with the film's director, Terence Young and made in Jamaica by a West-Indian dressmaker known to Andress and Young; it was the only one made for and worn by Andress as Honey Ryder and had been designed to be a practical working 'action' garment suitable to withstand the rigours Andress' role imposed on it"